Fulmar back panel is done and put on a holder. It measures just over 9-1/2" and is 3-1/2 repeats of Chart E. Now to pick up the fronts and knit down until the front matches the back in length. 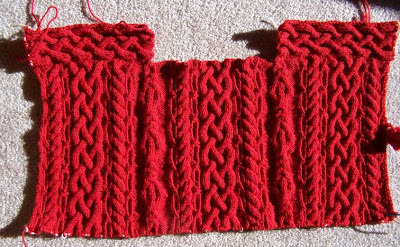 At that point, width can be added to the body and front and back joined and then knit in the round. 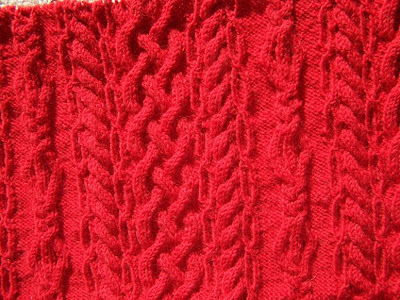 Knitting from the top down in this method was created by Janet Szabo and is called FLAK. I can get a bit further before deciding whether to make a pullover or a cardigan. I should go through all my sweaters and see which ones are worn the most and that I like the m ost. That count will help the decision process. I love the colorway and the stitch patterns. Can't wait to see it finished. What a genius idea knitting it FLAK style. I occasionally look through my Starmore books and frown at all the dropped shoulders, so I may copy your modification plan someday..
You are such a talented knitter! I wish I could knit like you do. I always enjoy reading your blog. Keep up the execellent work and I will keep reading and enjoying it! Merry Christmas!